This morning I posted my grunge lookbook, a style inspiration post aimed to help you get into the grungy spirit and ditch the prim and polished look that the pastel trend has brought us. As I pointed out earlier, there’s nothing wrong with the sugary sweet look (I embrace it too and will have a post on it soon!) but this summer I’m feeling far more ’90s and far less ‘done’ so I want a look that’s easy, off-duty and seriously cool. Today I’m going to bring you the very best high street picks for replicating the look and give you a few tips on finding the perfect grunge pieces for your wardrobe. First up, we’ll start with tops. Ripped, worn, generally past-their-heyday tees are perfect for this look but if you don’t feel comfortable donning your old t-shirts that almost hit the bin, then my high street picks may have the answer. If you don’t want to give up print for grunge, opt for washed out florals, tie dye or dip dye detailing which will work great with jeans. This picture from my grunge lookbook of Lea Seydoux shows a more washed out floral top which adds to the look. 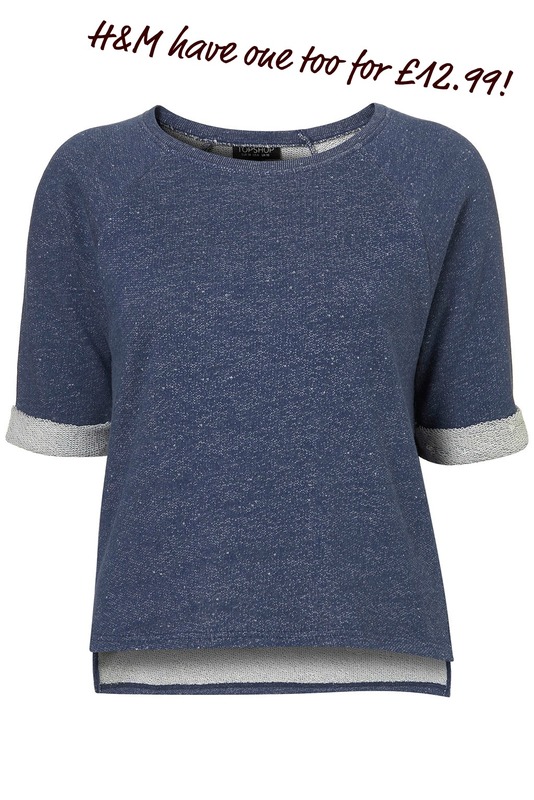 This oversized top from Topshop is perfect for the grunge look as it’s very loose-fitting and great for layering. Pair it with your favourite hoody and jeans for an instant understated look, or go a bit more grunge/glam by throwing a spiked necklace over the top to add edge. If pattern is still your forte and you can’t possibly say goodbye, a bralet is a great way to add a pop of pattern to a grungy ensemble. 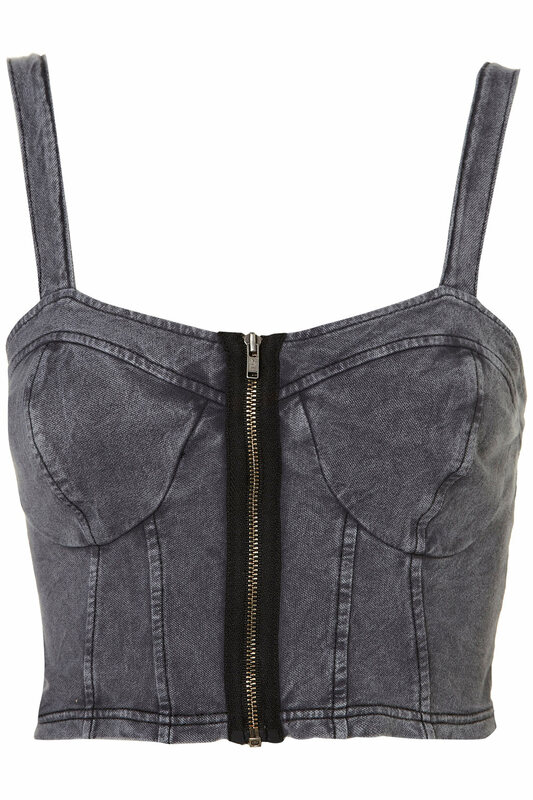 So many great grungy vests and tees have super low armholes, so a bralet is a great way to keep everything concealed, yet add extra interest underneath your layers. 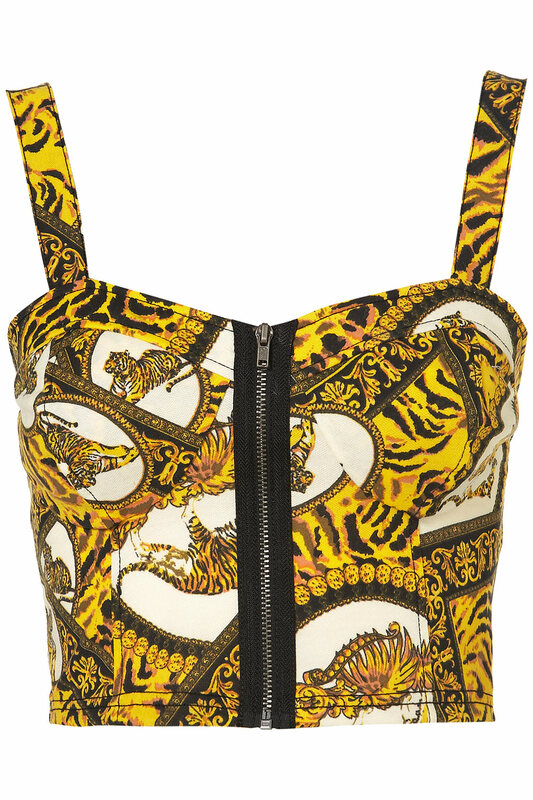 Topshop have a great array of bralets on sale at the moment, here are my favourites. 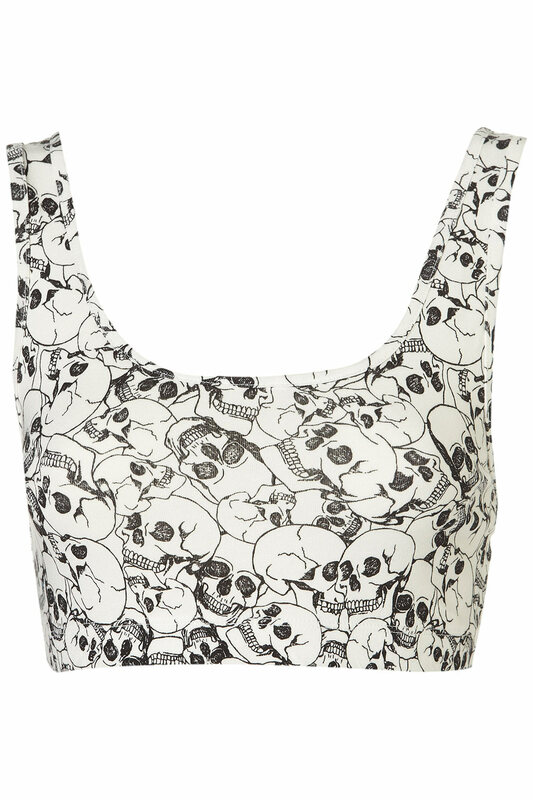 This one is a snip at £12 and instantly creates a grungy vibe with the skull pattern. 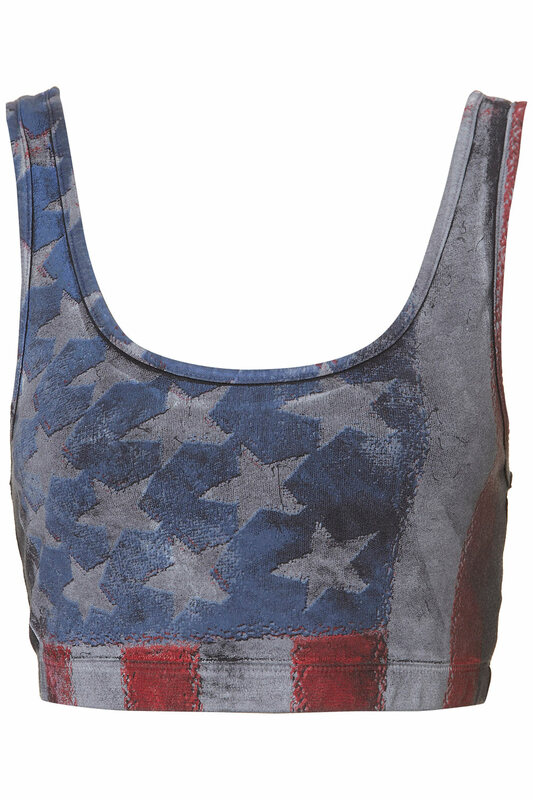 Again, a small investment at £12 this bralet is a great grunge piece, washed out flag print be it Union Jack or the Star Spangled Banner is a good way to go. Denim is an old favourite and it’s a piece that will fit easily into your collection. 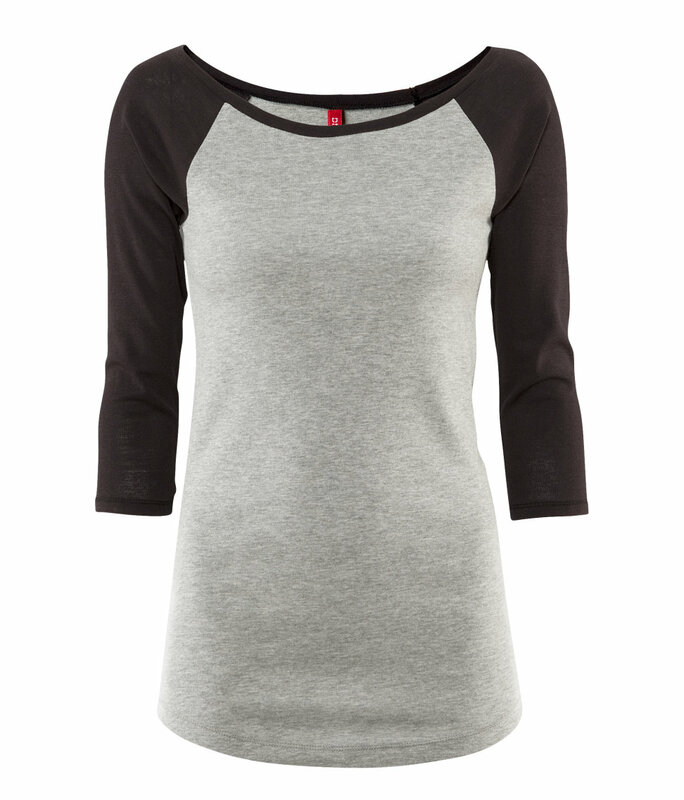 A simple tee in a grey or a blue is a must-have wardrobe staple and proves perfect for this type of look, the slouchier the better is the only rule to follow here, and comfort is of the upmost importance. I bought this tee several weeks ago and have loved how versatile it is. I pair mine over my black skinny jeans and wear it with converse and a statement chain necklace to add some interest. It’s great with a wine lip as it gives it that extra grungy look but still adds a pop of colour. 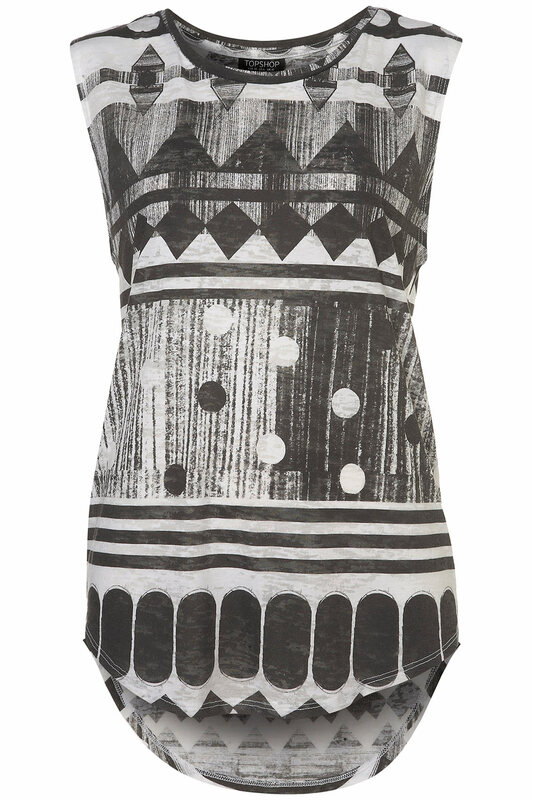 I bought an almost identical top to this in H&M again a few weeks back and have worn it to death. I’ll be featuring it in an upcoming OOTD as I wore it recently to tone down some washed out floral jeans for a grungy, ’90s look. As an alternative to a heavy jacket on those hot summer days, use an oversized open shirt as your outer layer. 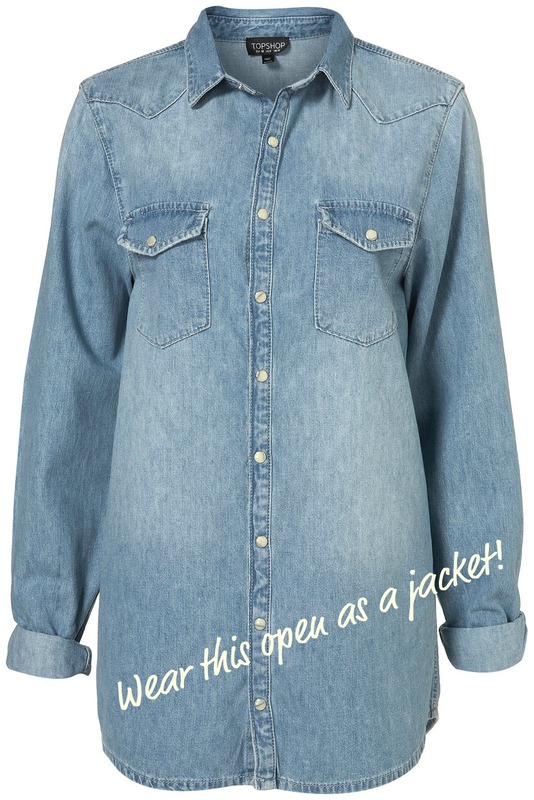 This denim shirt will look great paired over a worn tee and lots of necklaces with either jeans or shorts. With summer on the way, a good pair of shorts are a true wardrobe staple. You can never go wrong with a good denim pair, and for the ultimate grunge look you want to go for rips, tears and studs if you’re brave enough. This image to me sums up the grungy summer look and I was dying to find a pair just like these for this summer. 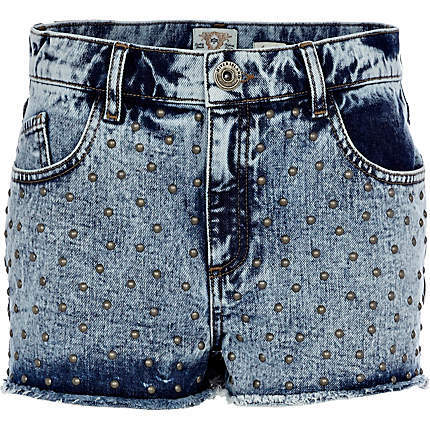 That’s when I came across these River Island shorts that are covered in studs in a light wash denim. These are so easy to wear with a slobby tee and converse, it’s a real no-brainer outfit for lazy summer days. 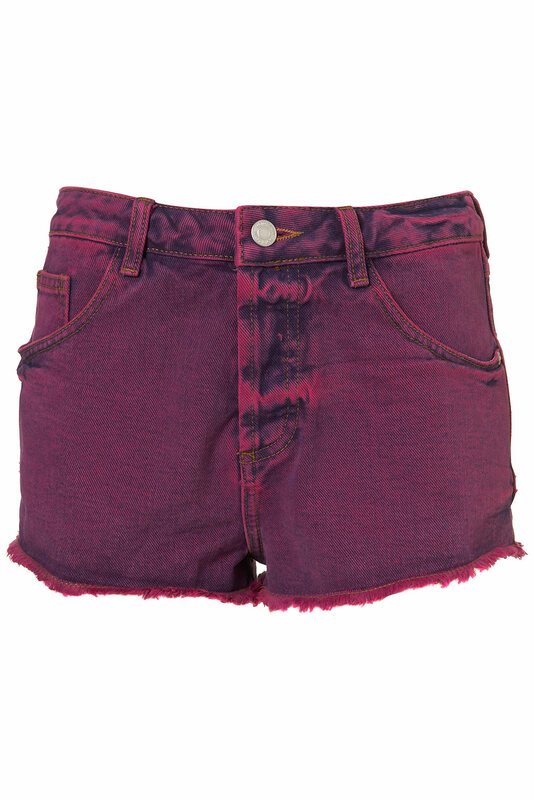 To add some colour to an otherwise neutral toned outfit, try these purple Topshop shorts in acid denim. Frayed round the egdes to add that extra worn in feel these will give you the much-coveted could-care-less look but with a more summertime vibe. Next up are good old jeans, perfect for an off-duty grungy look. To give your outfit serious style points, leave everything neutral but add pattern and/or colour with your jeans. This picture should give you an idea of the kind of look I’m coveting at the moment and there’s even a similar pair of boots on the way too! My most worn pair of jeans were bought at Topshop and I challenge a high street store to make more comfortable, flattering denim. This pair of acid wash jeans in grey will go with everything and anything grunge related in your wardrobe and make for an easy choice while getting dressed. Arguably my favourite piece from this post, this pair of jeans has been high on my wish list for weeks and they make the perfect focal point for any grungy ensemble. 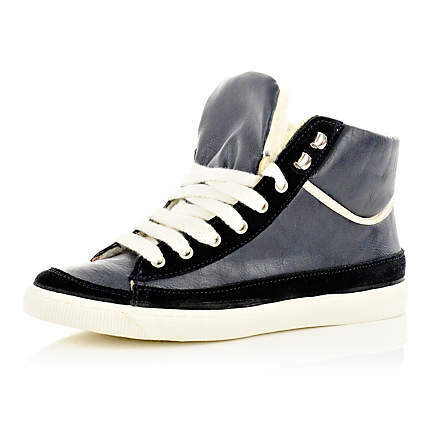 I’d pair these with the roll sleeve navy tee pictured earlier and my favourite converse. 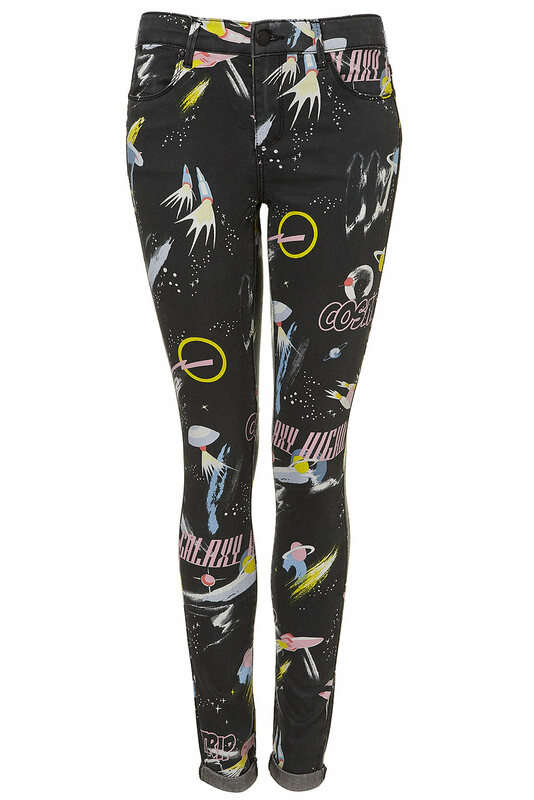 These fab jeans are also available as denim hotpants in the same pattern. Bargain alert! 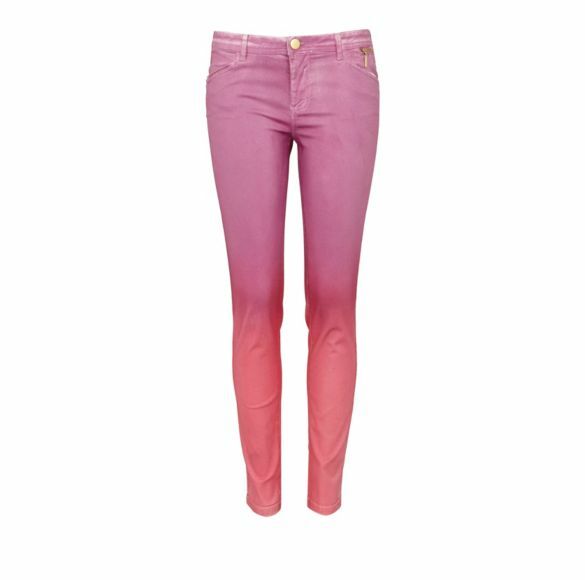 These amazing pink dip dye jeans are now only £15 in the River Island sale, so get your grunge on for a super low price by bagging yourself some of these statement bottoms. On to the feet! Lately all I’ve been wearing are my grey hi-top converse and there are few pairs of shoes that will give you a better grunge look. These awesome converse are bang on trend and I love the stud detailing, look to pairs like this to give you that laidback look. Converse are a great way to get the grunge look, but you can also add edge with a pair of sporty hi-tops that add a more urban feel to the look. In my earlier grunge inspiration post I featured one of my favourite bloggers who donned a pair of hi tops for a grungy/urban look in NYC and I love the effect. This pair from River Island are perfect for recreating this effect, use them to give a feminine look a more masculine edge. After all it is grunge. Lastly for footwear, a good old fashioned biker boot is always a winner and you can’t go wrong for £40 with these River Island boots which have just hit the mid season sale. Don’t miss out, sharpen your elbows and get routing instore. It’s the last part of today’s grunge lookbook, and where would we be without killer accessories? 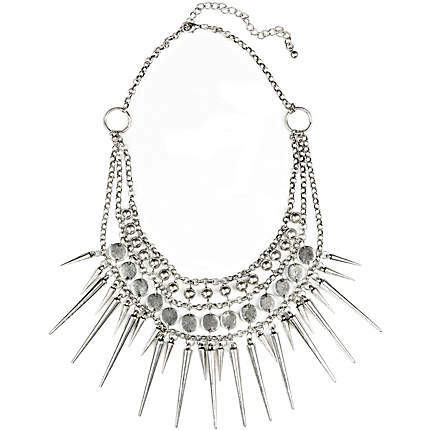 I’ve picked out two pieces from River Island that I think scream grunge, and we’ll start with this spiked necklace. For £10 it’s reasonably priced for a statement piece like this and thrown over a worn tee it is grunge personified. 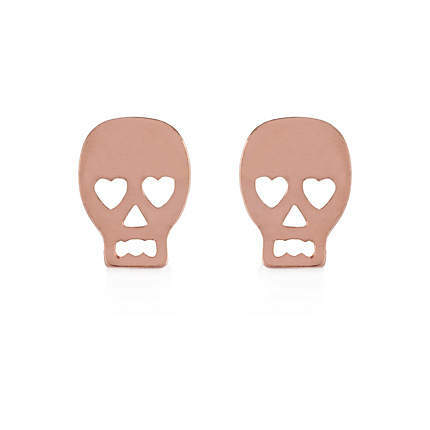 For a less full-on look, these cute studs add just the right amount of grungy style, but without being OTT. For only £3 they’re a great little piece you can incorporate into your collection. Not seen any accessories you like? Topshop have a huge range of grungy jewellery at the moment and H&M also have a great collection of which I’ve bought a few pieces recently, look out for a separate blog post on H&M’s grunge glam jewellery coming up soon.